Up to 92% of primary care patients either don't remember to take their medications or take the improper dose. This is primarily a problem among the elderly and those in developing countries, and since neither group has particularly large smartphone use, most apps on the market aren't very effective in engaging users. This problem is spread across multiple illnesses, including asthma, cancer and palliative care, depression, diabetes, epilepsy, HIV/AIDS, hypertension, and tuberculosis. In the U.S. alone, excessive healthcare costs due to unintentional medication misuse are approximately $177.4 billion each year. Hospitals and insurance companies have an incentive to employ technology that reduces preventable healthcare costs, improves performance standards, and improves patient health, and would thus benefit from increased and accurate medication adherence by patients. Most current applications and technologies place the burden of inputting and tracking medicine intake on patients, adding an extra barrier to tech adoption and making it unaccessible to those without smartphones. In developing countries, adherence to highly active antiretroviral therapy (HAART) for HIV/AIDS is the most effective way to manage disease spread and progression. However, patient consistency in taking HAART medication is under 70%, which isn't good enough to contain the disease and has contributed to its spread. Introducing technology to providers in those areas that improves correct patient medication use and limits the spread of infectious diseases improves both individual patient care and public health. 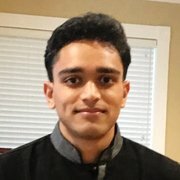 PillPal is an automated medication reminders application that helps patients remember when and how much to take of each medication. While filling patient prescriptions, hospital pharmacies would enter the patient's medication dosage and cell phone number into the application. 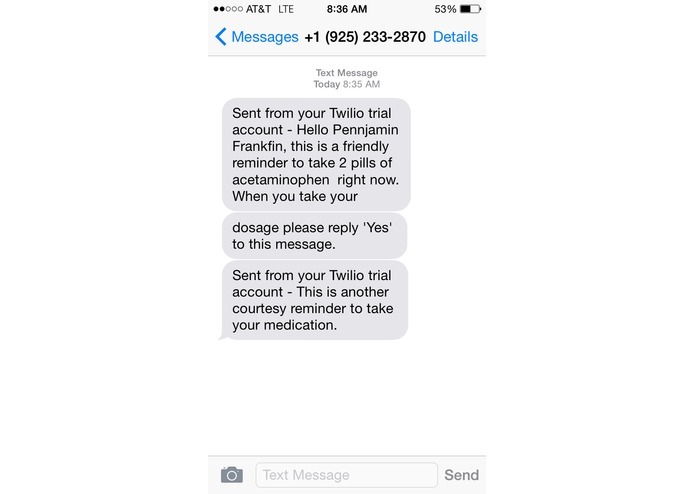 Using Twilio, patients will receive customized text message reminders--at the exact time they should be taking their medication--containing the drug name and correct dosage. This system should improve medication adherence and minimize incorrect dosage intake. The comparative benefit of this technology compared to others on the market is that this features provider-driven input of patient prescription data, assuring that the dosage, duration, and corresponding medication is accurate. Studies have shown that initial investments in interventions to enhance adherence are fully recovered within a few years and recurrent costs are fully covered by savings. These “cost-saving interventions” are firmly linked to the prevention of disease relapses, crises and/or complications. From a societal point of view, most interventions aimed at enhancing adherence have been shown to result in cost-savings, due to the improvement in patients’ quality of life, indirect costs avoided, and increased productivity. We believe that integrating the roles of physicians and pharmacists to prescribe and deliver medications is an effective intervention strategy. In a randomized, controlled trial involving physician-pharmacist teams that worked on patients with uncontrolled hypertension, 95 adult patients with hypertension (more than twice as many patients in the intervention group as in the control group) attained blood pressure control. 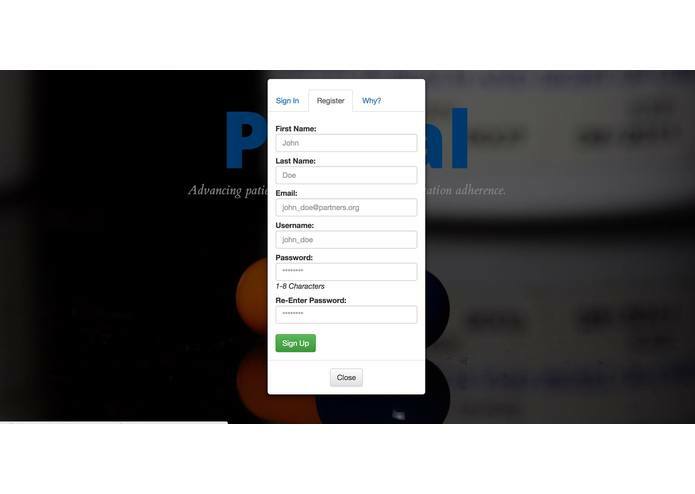 MailChimp-based email verification and registration limitation to selected hospitals and clinics ensures that patients only receive reminders from authorized providers. 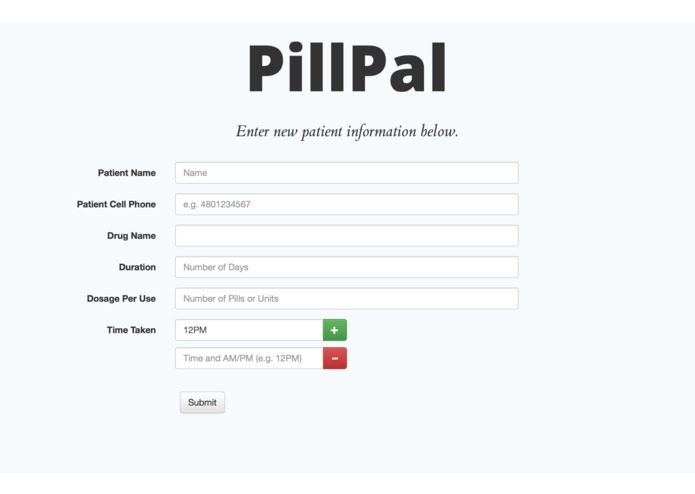 'Yes' or 'No' text responses from patients immediately following hospital data entry into PillPal acts as a secondary checkpoint to ensure that patients are receiving the correct reminders. In addition, the closed-loop communication system sends additional reminders to patients if they haven't responded after receiving a reminder, assuring that they're complying with their prescriptions. Compliant with HIPAA standards, when providers input patient information, all of the data is encrypted prior to being sent to the server. The data is encrypted using a private RSA key stored on the server-end. Decryption at the client-end using AES is initiated in the case that Twilio sends a call to the server to retrieve patient information for notification purposes. This assures that no loopholes in encryption of patient information are present. Elderly patients, who are the most likely to have trouble remembering their medications, are the least likely to have and use smartphone-based medication reminder apps, much less take the time to input the information for each medication in a phone themselves. Utilizing SMS-based messaging from the hospital allows any patient, with any kind of cell phone, to receive automated reminders and maintain peace of mind about their medication schedule. In the developing world, the pervasiveness of SMS technology is already evident by mobile financial transaction systems like M-PESA. 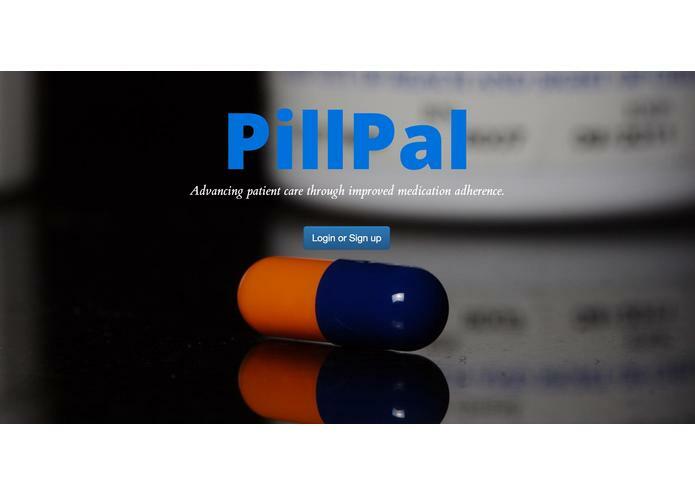 Hospitals and clinics can utilize PillPal to remind patients about their medications as well as schedule vaccine shots. In the future, the back-end system could be integrated into an EHR system, such as Epic, and include a simple checkbox on a physician-facing interface that can be clicked if the physician wants to send SMS reminders to a patient. Healthcare insurance companies have a financial incentive to recruit and maintain a healthier patient pool. Incentivizing hospitals and patients for better medication adherence by reducing deductibles, copays, or coinsurance for patients who consistently follow their medication schedule could improve the feasibility of introducing the application into new health systems. Sabaté, Eduardo, ed. Adherence to long-term therapies: evidence for action. World Health Organization, 2003. 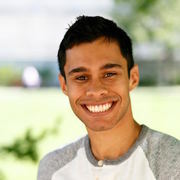 Bogden, Paul E., et al. "Comparing standard care with a physician and pharmacist team approach for uncontrolled hypertension." Journal of general internal medicine 13.11 (1998): 740-745.